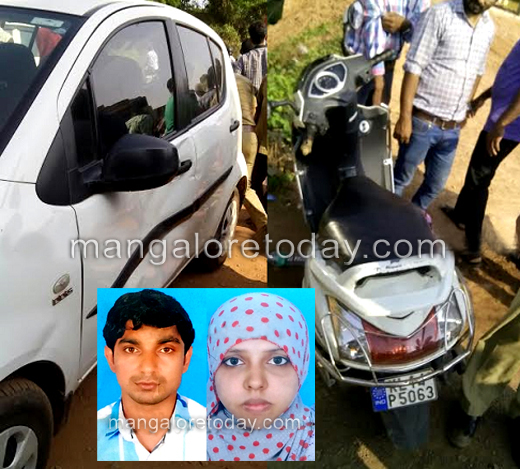 Kasargod, March 8, 2016: In a fatal incident young couple lost life in road accident at Vamanjoor check post near Manjeshwar in Kasargod district on Tuesday, March 8, evening. The deceased are identified as Zakir (32) and his wife Haseena (24), residents of Pavoor. Couple’s one year old child escaped with minor injuries in the accident. The couple was plying towards Uppala on a scooter. In a bid to overtake a tanker the rider lost control and the scooter fell on its side. The couple were thrown on the road and were crushed under the wheels of another vehicle passing on that road. Zakir died on the spot and injured Haseena was rushed to a hospital but she breathed her last on the way. A case has been filed in Manjeshwar police station. Never ride the two wheeler in a hurry because its very risky. You yourself have become the reason for the death in mishap.